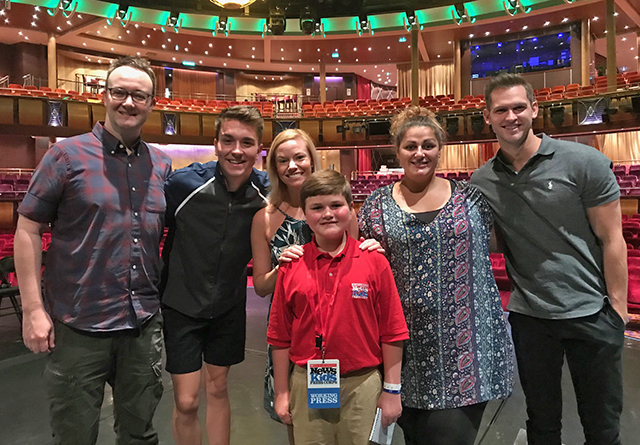 Broadway on the High Seas | Kid Reporters' Notebook | Scholastic Inc.
Over the past seven years, the Amber Theater has featured a variety of hit theatrical productions. But you won’t find the theater on Broadway. It is located on one of the largest cruise ships in the world, Royal Caribbean’s Allure of the Seas. I recently traveled on the ship, where I met with the cast and crew of Mamma Mia! They explained what it takes to put on a show at sea. “The safety of our guests and performers is our number one priority,” said Samantha Grassano, who works with Royal Caribbean’s stage crew. Since the ship moves constantly, sets have to be compact. Another challenge is that the theater is used for different shows and activities during a given week. There might be a 3-D movie, Bingo, and a Broadway show all in the same day, so a show’s backgrounds and props have to be stored efficiently. After talking with cast members and getting a backstage tour of the Amber Theater, I attended a production of Mamma Mia! Audience members loved the full-length production, which features music by ABBA, a Swedish pop group. By the end of the show, people were on their feet, clapping and singing along. Nearly 6,000 passengers—from infants to grandparents—sail on Royal Caribbean’s Allure of the Seas each week. In order to appeal to a variety of ages, shows incorporate acrobats, actors, and even ice skaters. But productions at sea are worth all of the extra effort for the smiles they bring.